A royal celebration or a royal waste of resources? 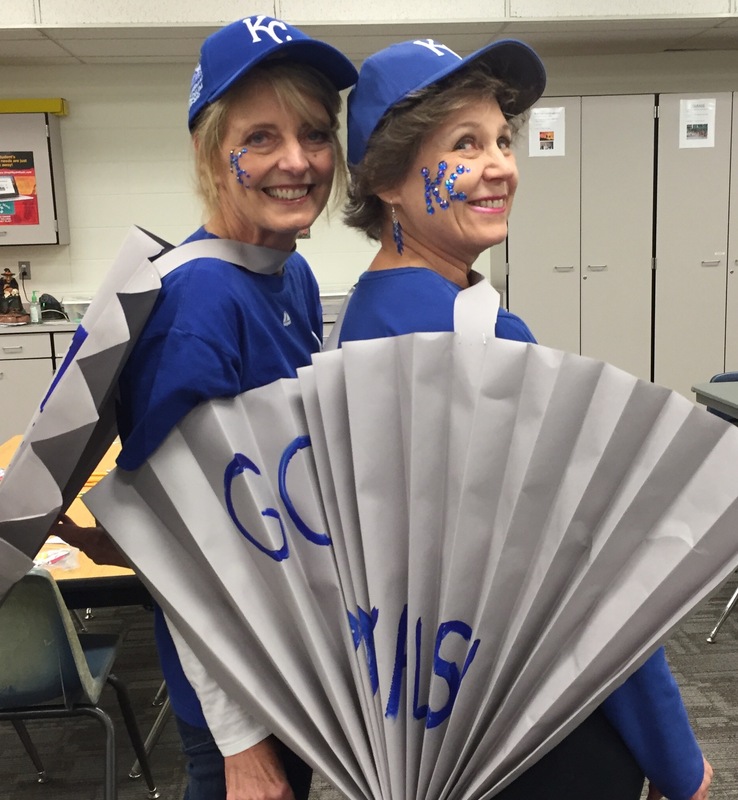 Linda Graham dressed up as a Royals fan for Halloween. Royal fans across the country have devoted enormous amounts of resources (time, money, energy, etc.) in order to cheer on their Kansas City Royals. The over half-million people at the parade yesterday gave up many things to be there. We had our different reasons for going, but I would guess that most everyone who attended feels royally exhausted today, including those who had to clean up after us. It was thrilling to feel the energy of the crowd and watch the sea of blue grow and grow on a beautiful November day. I also felt keenly aware of the fact that for every person who attended, there was someone else in the city who could care less about the Royals success, or who felt royally put out/off by this celebration. We probably all know parents who were scrambling to find child care, or perhaps we were among those who were late to appointments or work due to the traffic, or maybe some important things got cancelled or postponed. It was a royal mess for some and a royal celebration for others. My very scientific survey that I passed out at lunch. Case in point: On Monday I was participating in a three-day KS Leadership conference. I decided to have some fun with the leadership principles I was learning about and so I started a survey in order to test the different points of view in the room. 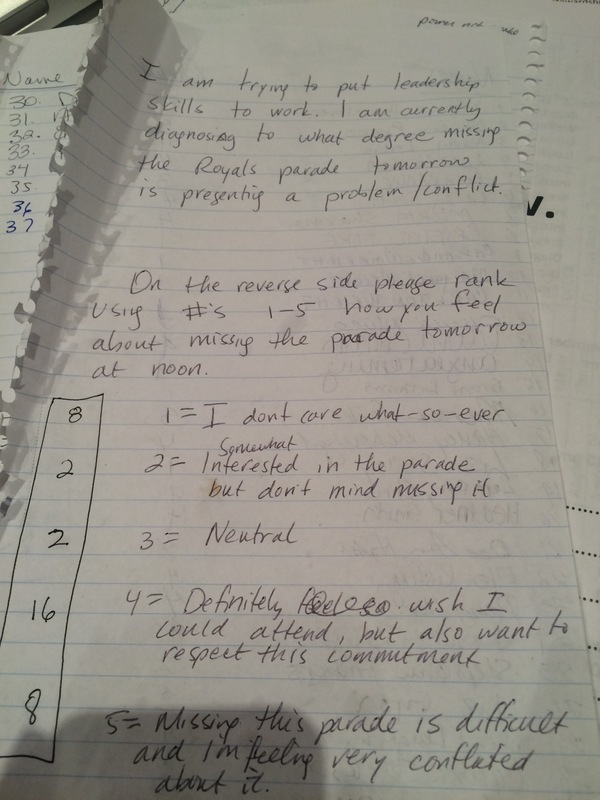 Out of 36 participants, eight people said they could care less about the Royals parade and eight people said that they would consider missing out on the conference in order to attend the parade (I was one of the eight who wanted to go to the parade). The rest were somewhere in between on a scale from 1-5. The leaders of the conference took this survey and ran with it. They led us in a process whereby we heard different people reflect on their values, their frustrations, competing values, and annoyances. It got heated at times when someone said, “I’m not judging here, but clearly some here care more about becoming good leaders and others care more about baseball.” The KS Leadership Center staff was remarkable in helping attendees hear multiple perspectives and explore competing interests. While a lot of people commented on the sense of community they felt at the parade, I actually think this conference experience was closer to true community because we were all asked to think about our assumptions, competing values, and decision making process. This is the harder kind of community to achieve, but perhaps the stronger kind. I don’t know if I made the right decision when I left this conference and attended the parade. Perhaps there wasn’t a right and wrong in this situation. What feels right is that I didn’t just slip out the back door and instead, helped start a group conversation about values, priorities, and choices. Thankfully when I arrived back for day 3 of this conference I was met with nothing but smiles and a hot cup of coffee. I’m still deciding whether or not I will reference the Royals on Sunday. If it was up to my loving partner, I would move on from baseball. Whether I preach about baseball or not, I hope that Rainbow continues to be a place of true community, where we learn from one another and remain open to multiple perspectives all year long as we experience the various successes, celebrations, tough decisions, mistakes, and failures that make up life. 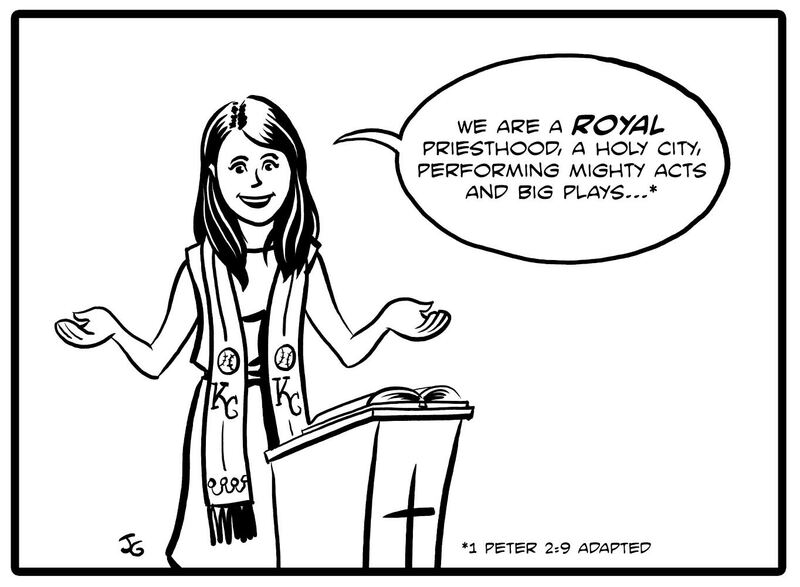 That’s to me what it means to be a true royal priesthood.